It hurts to watch someone you love struggle with addiction. No matter how much you may beg or plead, they continue to hurt themselves. They suffer legal troubles, the loss of relationships, and the degeneration of physical health. Meanwhile, they often hurt those they love most in the process. Requests to seek help are met with verbally—and sometimes physically—abusive outbursts. The lies, the theft of money, and the missed obligations pile up to the point that “unmanageable” hardly even begins to describe it. At this point, the family might consider staging an intervention. There are many benefits to staging an intervention. Addicts and alcoholics suffer greatly from denial, to the point that they fail to recognize the impact of their use. On some level, they may realize that drugs and alcohol are ruining their life. But with every consequence, they seem to lower their expectations of themselves. They set a new bottom, a new consequence that they are sure they’ll never suffer. Some will eventually find their rock bottom, but others may never get there without help. Fortunately, you have the power to help them. But if this is your first time staging an intervention, you may understandably have some questions about how it works. And these questions require answers if you wish to maximize your chances of success. There are countless variables that can only be determined by your family dynamic, as well as the personality and habits of the addict in question. In general, however, the following discussion should help get you started. When staging an intervention, the timing requires two considerations. First, you must consider the timing as it pertains to your loved one’s current stage of addiction. Second, you must consider when the actual intervention itself is to take place. Regarding the first consideration, you unfortunately will not find a perfect answer. Most will tell you that addicts and alcoholics must hit rock bottom before they can truly appreciate the benefits of seeking recovery. But in the case of staging an intervention, this isn’t always true. While many addicts will not elect to enter recovery on their own until they decide they’ve finally suffered enough consequences, an intervention may prove effective in opening their eyes before they reach this point. In fact, this can happen even when they initially show resistance, provided they understand the consequences of continued use. On the other hand, staging an intervention too early in the addiction cycle might yield little in the way of results. After all, how do you open someone’s eyes to the consequences of their substance use when said consequences have yet to establish a pattern? The second consideration offers a slightly greater opportunity to influence your chances of success. First, ensure that you plan the intervention for a time when your subject is not likely to be under the influence. Second, plan it for a time when the participants will be able to show up. And third, make sure you give yourself time to thoroughly plan ahead. Not only will you want some time to emotionally prepare, but you’ll also want to give yourself as much time as possible to solidify the rest of the details. As you’ll see, there are more than you might expect. Setting the time will be one of the easier preparations to make, since you likely know the subject well enough to be familiar with their habits. This makes it easier to choose a time during which you can expect them to be clear-headed and attentive. Unfortunately, the rest of the details are sometimes less predictable. Take, for instance, the matter of location. You probably want to choose somewhere comfortable. Somewhere familiar. Many families simply hold an intervention in their own house. But you also want time to stage a rehearsal intervention, and doing this in the home presents some difficulties unless you can state with absolute certainty that your loved one will not return home during your rehearsal. 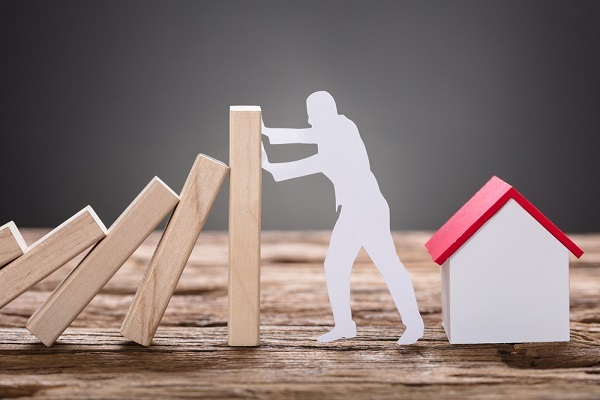 Home interventions may also backfire if the intervention becomes hostile, as the addict will feel betrayed in a space they once considered safe. That’s why you’ll want to make a few other preparations to help ensure a loving and supportive atmosphere. One such preparation concerns the people in attendance. You want your participants to include friends, family members, co-workers, classmates, or other individuals who care about the person and wish to see them recover. However, you’ll want to exclude any such individuals if you do not believe them capable of delivering the right message. For instance, you should not include a person who always responds to your loved one’s substance abuse by yelling, name-calling, and playing the blame game. You already run the risk of encountering hostility from the addict. Don’t run the risk of including people who will only serve to pour fuel on the fire. You might even write down what you intend to say. 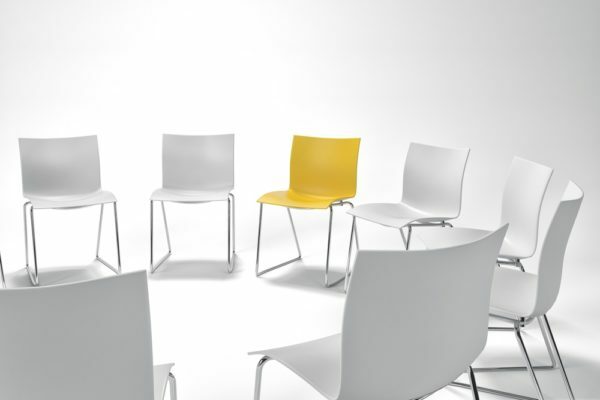 Staging an intervention often fails to yield results when the participants become side-tracked and turn their message into a laundry list of grievances. A written statement helps prevent this, thereby preserving the supportive tone of your message. Finally, you need to plan for the possible outcomes. We’ll get to that in a bit. First, let’s discuss how the points we’ve discussed thus far come together in the overall process of staging an intervention. You can gauge certain aspects of the process from our discussion thus far, and you may even know a bit about it from television programs or prior research. Nonetheless, it’s still worth going through point by point. First, you ensure the arrival of your subject. This part is usually easy, so don’t overthink it too much. Some fictional television shows depict their characters staging an intervention by simply ambushing a person. This can work, but it tends to prove risky. For one thing, it raises your chances of encountering resistance. Second, if you use the model in which the participants simply wait for their loved one to wake up, you can’t be certain that they won’t hear people arriving in the morning and catch wind of what’s happening. Simply tell them to be at home, or whatever your designated location happens to be, at the appropriate time. Invite them under false pretenses if necessary, but definitely don’t spook them into blowing you off or using before they show up. When they arrive, the first person to address them should be the person leading the intervention. Perhaps you, or another family member. You might also choose to enlist the help of a third party. Candidates include a family doctor, a religious authority, or a professional interventionist. 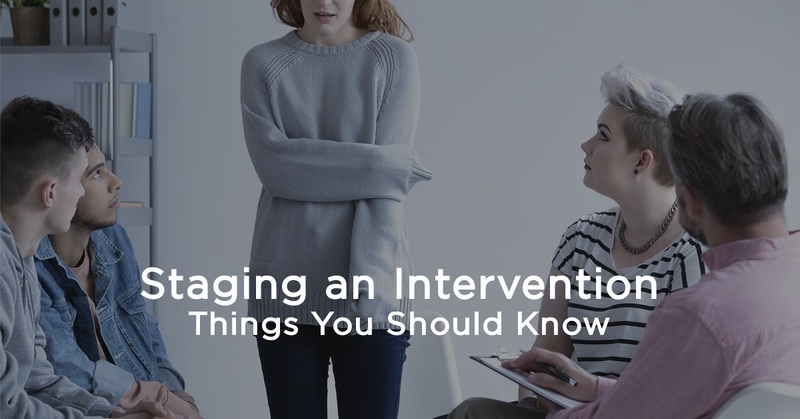 It isn’t unusual to seek help when staging an intervention, and these are among the most common sources people utilize when doing so. A third party can help you plan the intervention, while also relieving some of the family’s emotional burden by providing additional support. Even when the addict resists or denies information, stay on track. The intervention leader must do their best to mediate, keeping people from becoming too hostile or saying things that might obscure the message. Following this part of the process, you will arrive at the most important part of staging an intervention: the choice. We hesitate to use the word “ultimatum,” as it connotes a challenge. You must offer your loved one a choice, but try to do so without aggression. The choice offered may vary from case to case, but usually the goal of staging an intervention is to encourage the addict to seek treatment. In this case, you should prepare ahead of time. Choose a treatment center, one that offers the continuum of care that you consider most necessary. 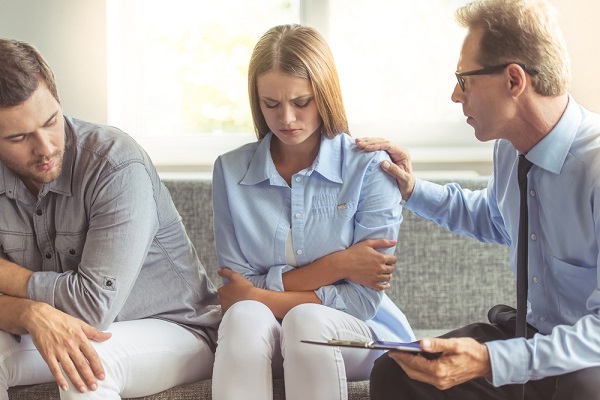 If your loved one suffers from co-occurring mental or emotional disorders, then you may prefer a dual diagnosis facility specializing in cognitive behavioral therapy. You may also prefer a treatment center that offers addiction education, family dynamics counseling, biofeedback or holistic care options. Younger addicts and alcoholics also benefit from treatment programs that offer life skills training, and heavy users will benefit most from a facility that operates a detox center. Once you choose a treatment center, you should prepare for possible success. Generally, you don’t want to wait too long after staging an intervention to begin the treatment process. Your loved one may need to get some ducks in a row, such as taking time off from work or school. 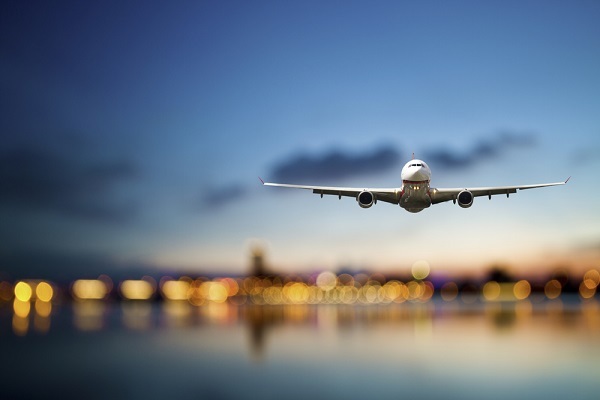 But if they have few obligations, you may want to ensure they can pack and begin transportation as immediately as possible. This means you should know your transportation options ahead of time. You should also call your chosen treatment center prior to the intervention and double-check that they will have open beds. Also learn about their admission process, ensuring that you will not encounter any obstacles while getting your loved one into treatment. “In some cases, the person who is addicted isn’t ready or willing to accept responsibility for their problem. 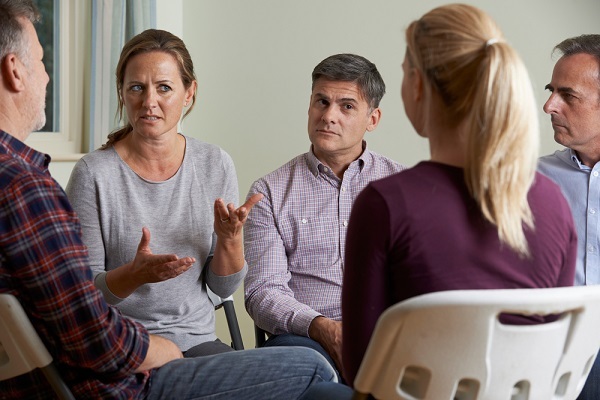 The intervention itself may set off additional behavior problems that can complicate the relationship between the addicted person and the intervention team members. This is the hardest part of staging an intervention. But if your loved one refuses treatment, then consequences must follow. Depending on the age and situation of the addict in question, consequences may include: cutting off of financial support, loss of child visitation rights, loss of a vehicle, curfew or eviction. Some may even choose to end contact with their loved one altogether until they seek help. Whatever consequences you choose, you must follow through. Enabling will only allow the problem to continue. Of course, you can always increase your chances of success by involving a professional addiction recovery specialist. If you choose to go this route, feel free to contact us so we can provide you with more information on how to proceed. We can help get your loved one into treatment, and will provide you will emotional support as you undertake the stressful process of staging an intervention. Regardless of whether your loved one enters treatment or not, staging an intervention does not free you from further efforts. The process continues, and the rest of the work rests entirely on the family’s shoulders. We should provide some context here. This actually comes from a report on long-term intervention programs, which differ from the type of intervention discussed thus far. As you can tell from the word “child,” it also focuses primarily on adolescents. But this report still offers a few lessons that you should heed if you want to maximize your chances of success. After you’ve gone through the work of staging an intervention, you still have some decisions to make. If the intervention proved successful, your loved one will be safe in treatment. Perhaps you will ask them to stay in sober living afterward, or perhaps they will return home. Either way, you likely intend to see them again. You must decide what type of environment you will provide them when you do. More importantly, however, you should take some steps to work on your own recovery. The whole family suffers under the weight of addiction. When staging an intervention, many of the family’s struggles come to light. You might feel relieved after getting these off your chest, but you still need to process your feelings. Some may feel guilty after staging an intervention. Others find themselves tapping into unexplored anger. Now that you know your loved one is safe and you don’t have to spend every night worrying, all that remains is the residual pain from the times they hurt you. Family support groups, such as Al-Anon, help you to process these feelings. We also provide our clients with access to family therapy, which can help improve the overall family dynamic by laying all cards on the table in a healthy way. No matter what, you find yourself with a bit of freedom to take care of yourself and focus on improving your own life. Don’t let it go to waste. Staging an intervention is hard work. It’s emotional, dramatic, and in some cases it can even be heartbreaking. But whether your loved one decides to seek treatment or not, your life must continue moving forward. And by increasing your own resolve, you set a glorious example for your loved one. You show them how strong a person becomes when they make an effort to live the life they want. They need to see that. Not just because it demonstrates your strength, making it clear that you won’t enable them anymore. But because it shows them the type of person they can become when they focus on their own self-improvement.